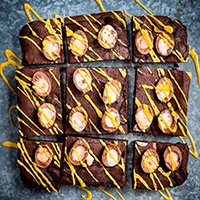 These Creme Egg Brownies have 'addictive' written all over them! Super easy to make, rich and fudgy - everything a good brownie ought to be! 1. Preheat the oven to 180C | 350F. Line a deep square pan (23cm/9x9in) with baking paper letting the paper hang over the edges. 2. Chop the chocolate into small chunks. Place the chocolate and butter into a small pot and allow them to slowly melt over very low heat or use the double boiler method. Take off the heat and set aside to cool slightly. 3. Put the eggs and sugar in large bowl and use a electric hand whisk to mix together until frothy and doubled in volume. 4. Gradually add the melted chocolate into the eggs and mix together using a hand whisk until smooth. 5. Sift the flour, cocoa and salt into the chocolate and mix together until the batter is smooth. Fold in half the creme eggs. 6. Pour the batter into the prepared tin and bake for 10-15 minutes or until the top is nearly - but not quite - set. 7. Remove the tin from the oven and arrange the remaining creme eggs over it in a neat pattern. Bake for a further 10-15 minutes or until the creme eggs have started melting and the brownies are mostly firm on top with a slight 'give'. 8. Pull the brownies out of the tin using the baking paper and allow to cool on a wire rack. 9. Mix the icing sugar, vanilla extract, food colouring (if using) and enough milk to make a pourable icing. Drizzle over the brownies and cut into small squares using the creme eggs as a guide. Best eaten within a couple of days. NOTES: you can place the creme eggs on the brownie batter as you put them in the oven. They will sink into the brownie more but won't retain their shape as well.